See supplemental documents referenced in the book. The authors reveal, for example, that some people try to restore a sense of order and control through increased wariness of others—especially of those who exist outside the societal mainstream. Additionally, voters under threat tend to prize “strong leadership” more highly than partisan affiliation, making some politicians seem more charismatic than they otherwise would. The authors show that a wary public will sometimes continue to empower such leaders after they have been elected, giving them greater authority even at the expense of institutional checks and balances. 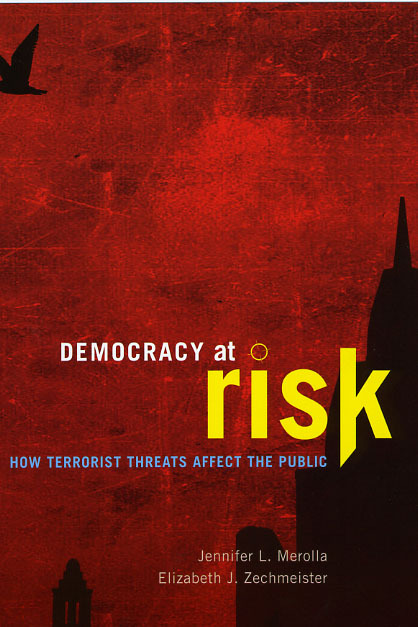 Having demonstrated that a climate of terrorist threat also increases support for restrictive laws at home and engagement against terrorists abroad, Merolla and Zechmeister conclude that our responses to such threats can put democracy at risk.